When was the last time you dodged a bull on your way home from a night out? Or had your way blocked by a flock of sheep? For most city dwellers the answer would be: Years ago, or never. The closest many of us come to farm animals is the meat counter at the supermarket. And yet it’s not that long since thousands of animals were driven through the Melbourne suburbs on a regular basis. Some of the busiest stock routes were here in Kensington, and you can see plenty of evidence around the suburb of how important they were to the local economy. Picking up my walk from Racecourse Road, I walked down Smithfield Road towards the river Maribyrnong, where I paused on an iron bridge. Looking west I could see the recently-built Buddhist Temple of the Heavenly Queen, with the golden statue of the queen herself gazing at the cranes of Webb Dock. 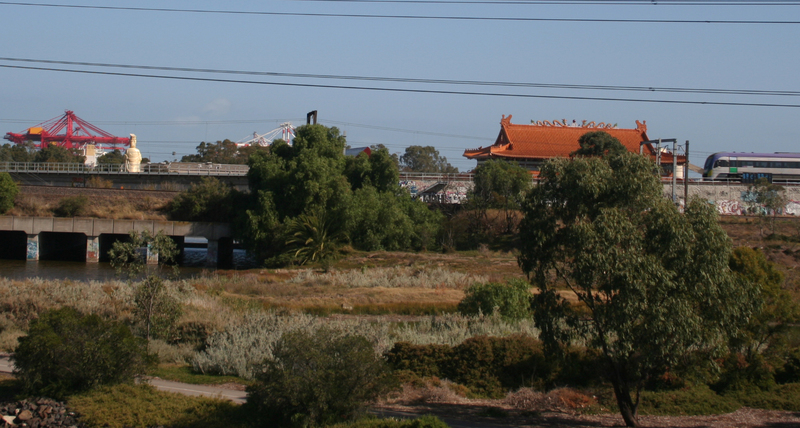 From the bridge I turned back towards the east, this time walking up the long bluestone path that led towards a long-closed Melbourne icon: the Newmarket saleyards. 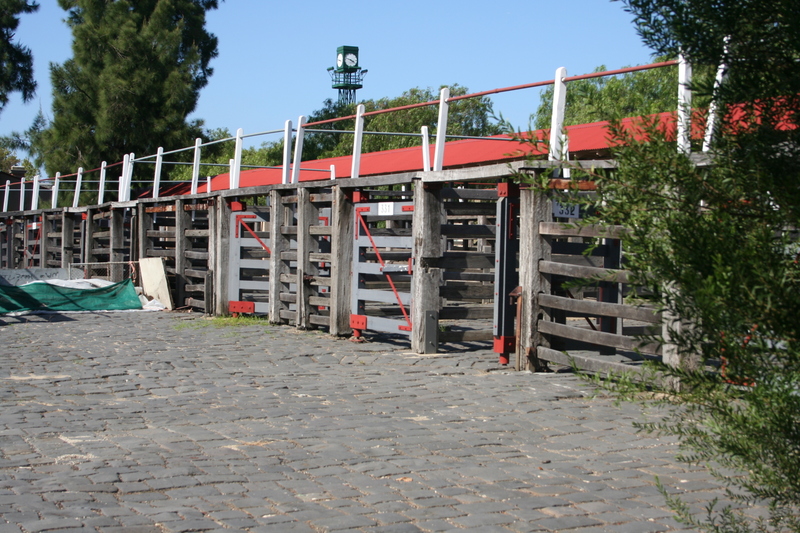 The saleyards opened in 1861 and finally closed in 1985. For much of that time they were the busiest saleyards in Australia, and among the biggest in the world. 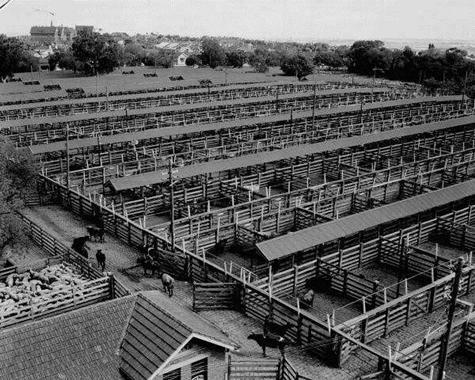 Millions of sheep, cattle, pigs and horses were driven through the streets to be sold there at public auctions. Aerial photograph of Newmarket Saleyards in 1958. Photograph created by Laurie Richards Studio, Alphington. Laurie Richards Collection, Museum Victoria. The area has since been converted into residential housing, and these days you can walk on bluestone pavers along the ‘Stockman’s Way’, which passes under Epsom Road and up the hill to the remains of the saleyard just south of Racecourse Road. The trail is quiet and leafy, very unlike the atmosphere back in its heyday, when sweating, swearing drovers and their dogs used to drive thousands of bellowing beasts along here – the racket and stink must have been incredible, along with the occasional excitement when an animal galloped off into the nearby streets. The new housing development (Kensington Banks) has been sensitively done, with dwellings surrounding areas of shared parkland. There’s a multitude of people jogging, riding along the bike track, walking dogs, and playing with kids on the shared park areas. As I walked up the ‘Stockman’s Way’ I met a guy who asked what I was taking photos of. Places of historical interest, I told him. Surviving parts of the saleyards include the old clock, some of the pens, and many bluestone cobbles. Kensington Community School occupies the buildings where the admin offices were based. I must have driven past it hundreds of times without knowing what was there. You can get a view of the saleyards from the school grounds, or from round the back at Bluestone Street. View of the remaining pens from the saleyard. Note the bluestone paving. In an underpass below Epsom Road there’s a mural created by Elizabeth McKinnon to commemorate the stock route and the saleyard. Of course, saleyards weren’t the only thing at the end of the stock route. Along Smithfield Road – named, presumably, after the famous London meat market – was a long line of slaughterhouses and wholesale butchers. Many years ago, in another town, I had a job in a factory next to a slaughterhouse and the sound of bellowing animals was pretty confronting. I dare say the animals being driven along the stock route had a good idea what awaited them at the end of it. No wonder some of them tried to escape into nearby streets. Associated industries sprang up in the vicinity of the saleyards. One of the largest local pastoral companies was Younghusband & Co, a powerhouse of the wool industry. As per the ghostsigns on its huge stores on Chelmsford street, Kensington, it was famous for wool, tallow, skins, hides and fur. Tallow is animal fat rendered from carcasses. It is used to make soap and, formerly, candles, among many other things. The production of tallow is one of the most disgusting processes imaginable, which involves chopping up and boiling down bits of dead animals. Hence you find soap and candle makers close to slaughterhouses. One of the most successful Melbourne candle makers was John Kitchen & Sons. Kitchen started out making tallow candles from butchers scraps in the backyard of his home in South Melbourne in the mid-19th century, but was ordered out as an offensive trade. The Kitchens moved some of its operations in 1870 to a factory in Footscray, where noxious trades of all sorts were warmly welcomed, and went from strength to strength. Two of the Kitchens’ brand names were Velvet Soap and Electrine candles, both made from tallow. Ghostsigns for these products can be seen in Kensington on the corner of Macauley and McConnell streets. I’ve long admired these signs – probably dating from the early 20th century – but hadn’t realised their relationship, or connection to the stock industry. Ghostsigns for Velvet Soap (on the left) and Electrine Candles (on the right) both made by J Kitchen & Sons. Kitchens had a candle factory in Port Melbourne, and the Port Melbourne Historical Society has some more information about the company – and some photographs of Electrine candles – here. As for Younghusbands, these days the building is the home of independent arts organisations (such as Revolt) and niche shops selling recycled industrial relics as nostalgia items. Perhaps we shouldn’t lament the decline and loss of the saleyard, and the noxious industries that accompanied it. On the other hand, the presence of stock routes in the heart of the city meant that city dwellers – at least those who lived near Newmarket – were forced to acknowledge the existence of the country, and its role in putting food on their table. It’s easy for people these days to imagine that meat, leather and wool – let alone soap – appear in shops by magic without any conception of where they came from. And urban types like myself might not see a cow or a sheep – or a farmer – from one year’s end to the next. Kensington is a great suburb for ghostsigns and here’s one more – one of the most beautiful examples in Melbourne. 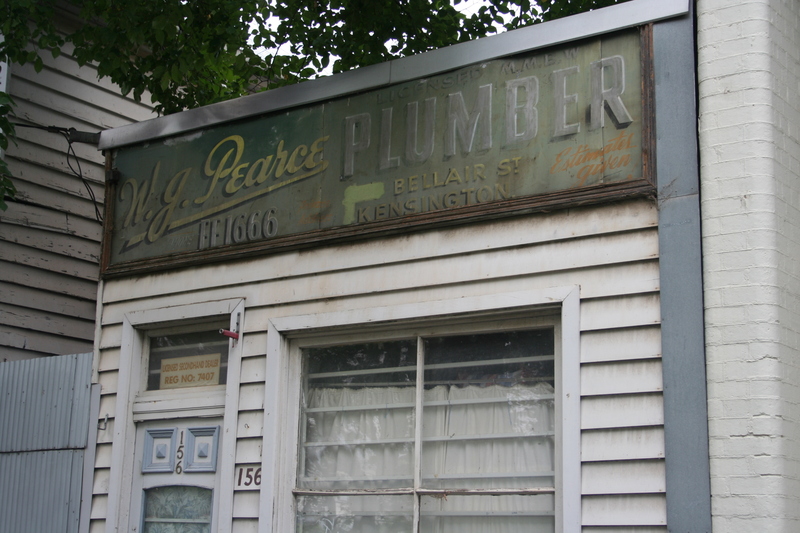 Bill Pearce was a local plumber who had a shop on Bellair Street from the 1940s onwards. His sign is much photographed but is well worth another look. I particularly like the four-digit telephone number, FF1666, which must surely have been long out of date by Bill Pearce’s later years. 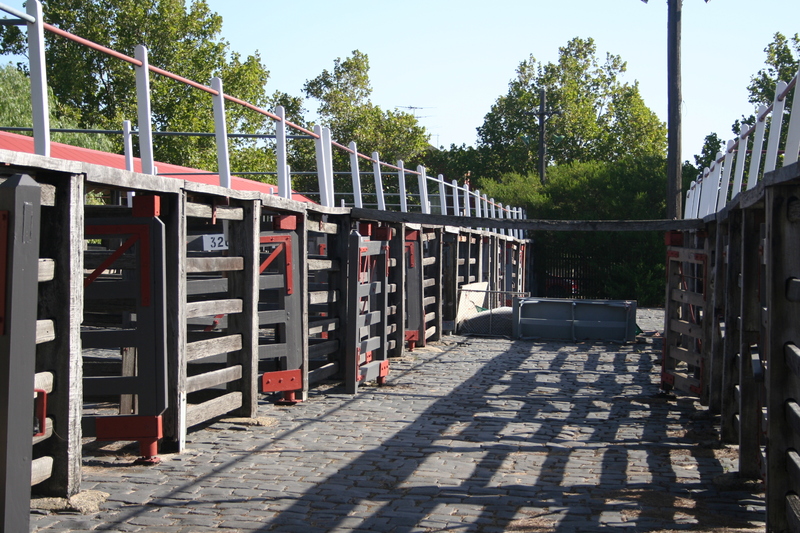 For more about the Newmarket stockyards, there is copious historical material at Museum Victoria. Check out their photos of the saleyards. For more photos of Kensington ghostsigns, see Stefan Schutt’s ghostsign blog, Finding the radio book. my husband Peter Kennedy worked at Newmarket cattle yards in 1973 for Elders Smith, Goldsborough Mort, Younghusband as a cadet auctioneer and they drank at the Pastoral hotel across the road which is now Woolworths. thanks for your blog. love reading it. Thanks for the comment Jen, very glad you like the blog and keep reading! Life as a cadet auctioneer in that environment must have been exciting, I bet your husband has some great stories. Very interesting blog and did indeed remind me of historical descriptions of the cattle drives through London and Glasgow. I think if people better understood where their food came from they would respect what was on their plate more. Thanks Alex. Yes, and maybe more of us would be vegetarians if we had a closer view of the food production system. 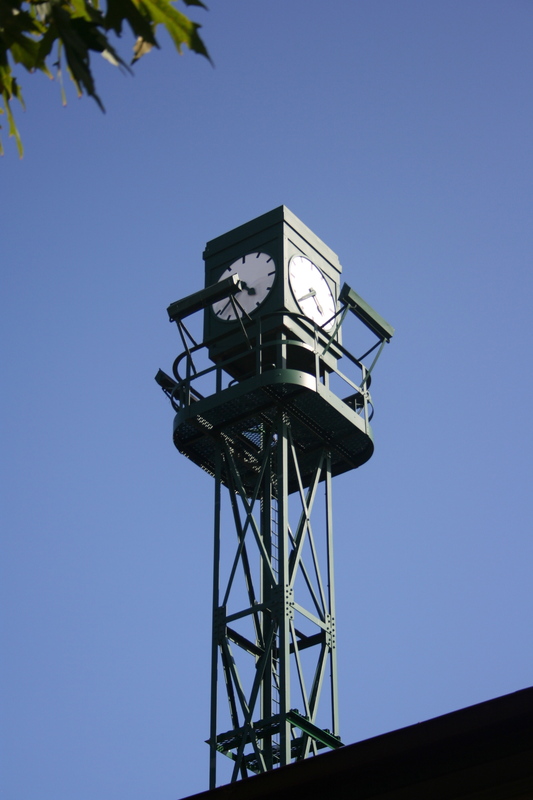 as a lad in Ascot Vale we would always know when the wind was in the South or East – the stockyards would waft over. Great memories of commerce and chaos and electricity and bustle those days. Few of my friends from the East would believe me that up until I was 12 I would catch a tram past cows for sale! Add to that the history of Whisky Hill – a stopping and drinking place for drovers coming from the sheep plain of the north (dry area any further south of Epsom Rd and East of Union Rd), and the RASV, and there was quite the animal funk around!